Delve is a fantastic product that provides a huge amount of value to a business an employees by allow relevant information to be surfaced to them without having to go and look for it. However, there maybe the case where a user doesn’t want Delve collecting ‘signals’ of their interactions. In this case here is how it can be turned off. 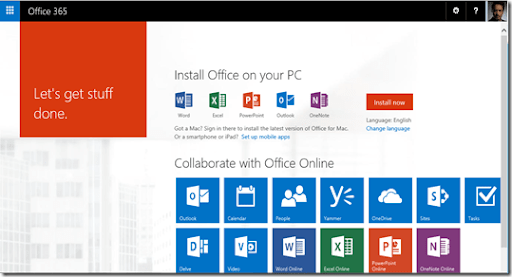 Firstly, login to the Office 365 portal as the user. In the top left of the screen select the App Launcher button (the one with the nine smaller boxes inside). This will display all the applications the user has access to as you can see above. You should now see the Delve home page for that user. Select the COG in the top right corner and then Delve settings from the menu that appears. 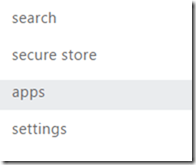 You should then be presented with an option, like the above, that allows you to disable Delve. Don’t forget to select OK to save any selection. 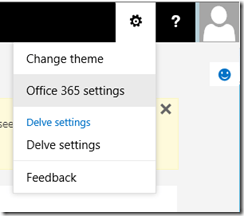 In the bottom left locate Admin menu option and select the SharePoint option that appears below it. This will take you to the SharePoint admin center. At the bottom of the menu on the left locate the settings option and select that. In the middle of the page that appears is the option to disable Delve for all users as shown above. Ensure you scroll down to the bottom of the page and select OK to save any changes you make. So there you have it. 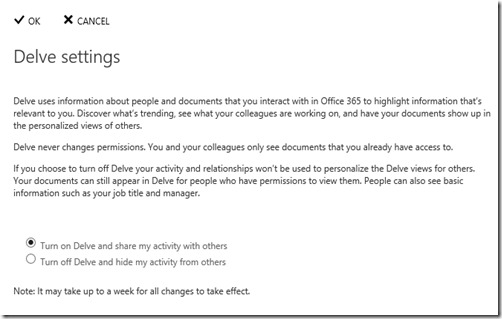 Any user can disable Delve if they wanted and an Office 365 administrator could do it for all users. But really, why would you? Once you use Delve you will see how much benefits it provides and how more relevant information it surfaces for people.